KnitKnit on The Martha Stewart Show! Wow. I never expected this to happen, but it did. 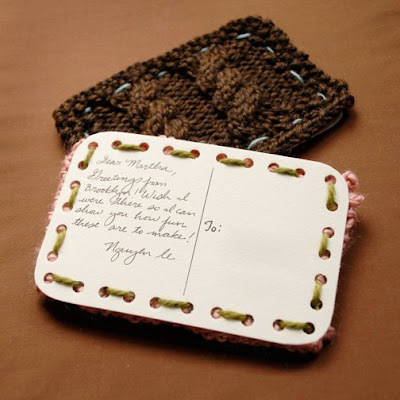 My knitted postcard & I are appearing on the Martha Stewart Show on Monday, March 23rd at 11am eastern for the knitting and crocheting show! You can check for your local show schedule on Martha's website with the zip code finder on the lefthand side. I have a short blip - 1 minute out of my allotted 15 min. of fame! How did this happen? Well, Martha's people contacted my people, which is really just me, and asked if I was interested in being on the show. Who would say no to the grand poobah of craft?! I was soooo excited, and met some really wonderful people at the Martha Stewart Show. The knitted postcard began as a project a year ago that I did for a creative group blog called Thing A Day that goes on for the month of February. The idea is to make something everyday of the month and post it on the blog. You can see and comment on what other people are making too. It's a wonderful inspirational kick to get the creative juices flowing. I decided to turn my knitted postcard into a creative chain mail and tag friends to continue the theme! The cable pattern is available for free here. The finished postcard is also available for purchase in my Etsy shop. Here I am cheesing on the set! I'm wearing a ribbed top knitted just in time for the show ;) (photo taken by my buddy Julie aka YourSecretAdmiral, who came with me) Thanks Julie! There were several other incredibly talented knitters & crocheters on the show as well as fantastically unique projects. I met the lovely Althea Merback of BugKnits.. She knits miniature art pieces with thin as pin needles that she makes herself! She knitted Coraline's star sweater in the film "Coraline" (bottom left corner of the frame)! Below, another of Althea's pieces - the most amazing knitted Grecian urn. The details are absolutely astonishing! It takes many many months to finsih a piece. And I also met the sweet Jou Ling of Amigurumi Kingdom who was another amazing crafter showing off her goods! 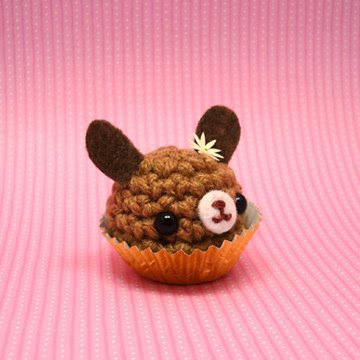 She crochets the cutest creatures including Jack the Sparrow inspired by Pirates of the Carribean, cupcake bears and little bon bon bunny rabbits! Here's a shot of the Martha Stewart Show set - more photos on my flickr!